Liquid Sky gets a remake from the guys who made The Inbetweeners. Or at least that’s what How to Talk to Girls at Parties looks like. Director John Cameron Mitchell brings us an adaptation of a Neil Gaiman short story starring Nicole Kidman. 1977. Croydon. Schoolboy Enn (Alex Sharp) is a punk. We know this because he pogoes out of bed, dons his t-shirt and chains and gobs at himself in the mirror. Then it’s time to bike it down to the local punk place with his punk pals where punk godmother Boadicea (Kidman) hangs out, trying to manage her way to on the torn shirttails of the latest punk group. We don’t need to talk about her accent except to say that EastEnders won’t be phoning her anytime soon. Off to an ‘after party’ – apparently such phrases, along with fist bumps and saying “part-ay” were a 1970s thing – the trio of chums find themselves in a strange house that turns out to be a coven of alien beings who have accidentally manifested themselves as several varieties of new wave weirdos. 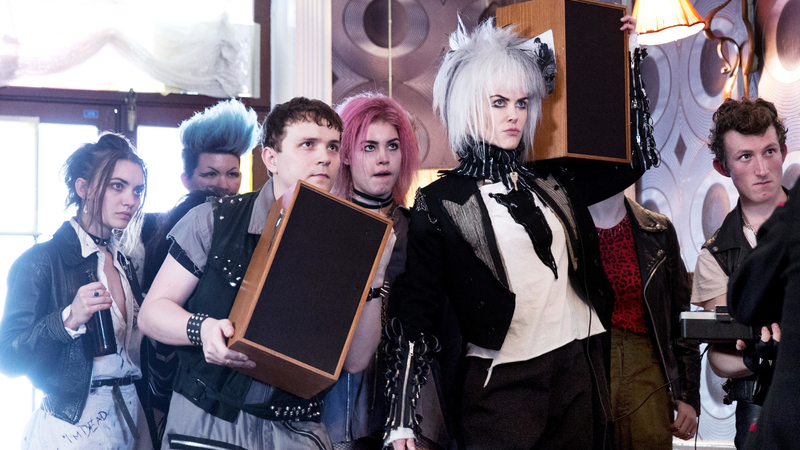 One of their number Zan (Elle Fanning) wants to escape the hive mind and so rebelliously ventures into the real world of Croydon with a doting Enn in tow. There’s some fish-out-of-water humour that begs immediate comparisons to Earth Girls are Easy and The Brother from Another Planet, but here the real alien appears to be the director. Mitchell’s understanding of punk seems to be the brandishing of two or three cliches, shouting a lot and name-checking bands. Punk has been repackaged and sold out by its own exponents so the fault wouldn’t be so evident if it wasn’t for the fact that Zan asks Enn “What is punk?” with the frequency of a green girl asking Captain Kirk “What is this thing you earthlings call love?” There is certainly some fun to be had. The office politics of the aliens is amusingly played by Matt Lucas among others and Zan’s habit of vomiting in the mouths of potential lovers wrung a laugh. Sadly, How to Talk to Girls at Parties’ weird late shift towards some kind of emotional heft, a pining for an estranged father arrive as totally unearned and worst still inauthentic. And the anachronisms, punk posturing and dodgy accents combine to create a film that might have been better titled How Not to Make a Film about Punk in 70s Croydon.